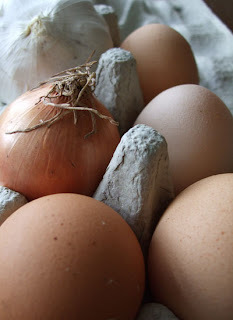 Alchemy in the Kitchen: Spanish Omelette – all it’s cracked up to be! Spanish Omelette – all it’s cracked up to be! Even when it seems that tumbleweed is the sole occupant of the kitchen, there’s bound to be a few potatoes and an onion or two lurking in the vegetable basket, and a clutch of eggs in the door of the fridge. That is all you really need to make a sublime and filling dish that wouldn’t be ashamed to grace the trendiest of tapas bars. Spanish Omelette is a wonderful dish to magic from a seemingly empty kitchen to the delight of unexpected and hungry guests. Cut it into slices and serve hot, warm or cold with a green salad or cut into cubes to serve with drinks. A mandoline cutter is useful for slicing the potatoes into uniformly thin slices though sometimes I prefer the chunkier texture of diced potatoes in this dish – whatever you’re having yourself! Heat the olive oil in a non-stick frying pan about 22cm in diameter. Meanwhile dry the potatoes in a clean tea-towel. Add to the hot oil along with the chopped onion and crushed garlic. Stir until the vegetables are glistening with hot oil then turn down the heat, cover and cook gently without allowing them to brown for about 20 minutes or until the potato is easily pierced with a fork. Break the eggs into a large bowl, and stir with a fork until the whites and yolks are just combined. Add the salt and a little black pepper. Add in the contents of the frying pan and stir until the potatoes are completely covered with egg. Pour the mixture back into the frying pan and continue to cook gently until the surface of the omelette is beginning to set. This will take about 10-15 minutes. Using a spatula or an egg slice, loosen the omelette around the edges. Cover the frying pan with a large plate, then carefully invert. Slide the inverted omelette back into the pan and continue cooking gently for a further 5 minutes or so. That’s it – Alchemy performed!